Alix Van Buren of La Repubblica, Italy’s leading newspaper, interviews King Abdullah II of Jordan. His Majesty King Abdullah and Italian President Giorgio Napolitano shake hands at the end of a press conference in Rome on Tuesday - Oct 20, 2009. During my visit to Washington, I heard many voices saying Iran, Iran, Iran. Instead I keep repeating Palestine, Palestine, Palestine. The failure to resolve the Palestinian Israeli conflict and achieve Arab Israeli peace is the most serious threat to peace and to stability in the region, including in the Mediterranean. That must be the priority. In the beginning there were great hopes. But now the horizon seems to moving farther away. My first experience was not a very pleasant one. We had major crisis between Jordan and Israel, the worst since the peace process. When we met in this office last May, sitting right here, the Israeli Prime Minister he made promises of pursuing peace: but since then Israel has not moved on those promises. I will trade notes with our Italian friends, we have a very strong relationship, both economically and politically, dating back a long time. I will engage with the Italian government, as part of the European Union, on the issue of the Israeli Palestinian peace process. We are interested in coordinating on mega projects that we are about to launch in Jordan, in construction, in alternative energy, water conveyance, rail roads and other projects worth about $ 20 billion over the coming 10 to 15 years. And here is the young King, leader of the moderates of the Arab world, steady in the alliances and sympathies with the West, always on the front line in striving for peace and for the development of his nation. 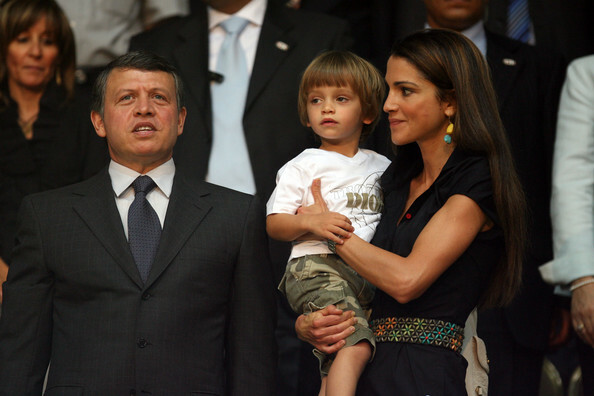 As a member of the Hashemite dynasty, he is a direct descendant of the Prophet Mohammed. Sporting a blue blazer, his eyes azure and jovial, he greets la Repubblica in his study in a pretty Arab palace on top of a hill above the city. His upright stature reveals his training at Sandhurst, in Great Britain, and his descendant from an illustrious lineage of warriors: his great-grandfather lead the Arab Revolt against the Ottomans in 1916. General, commander of the Royal Special Forces, he exhibits the same charisma as his father King Hussein I, idolized by the soldiers of the Arab Army largely recruited among the Bedouins of the desert inland, strongly devoted to the Crown. In his free time, the King is found of cinema: a declared fan of the science fiction series Star Treck, in his days as a prince he appeared in an episode. In physical shape, he is an expert motorcycle rider, rally driver, skydiver and frogman. Like his father, he flies with ease helicopters and jets. And with the same deep voice, in his English spiced by American ease, he starts hammering on the urgency of moving fast towards a peace settlement. Your Majesty, after seven missions by President Obama’s special envoy to the Middle East, America and Israel don’t seem to have reached an understanding. Are you disappointed? I’ll be honest – I was expecting more, and more quickly. President Obama, in the first 24 hours of his mandate, called for resolving the Israeli Palestinian issue. I was expecting more of a dramatic breakthrough in early Summer, and stronger showing at the United Nations, last month, with a true launch of the peace negotiation. But there has definitely been a delay. The issue of Israeli settlements, which the international community considers illegal, continues to be the outstanding issue. We are all asking a freeze, even if temporary, so that you can get Israelis and Palestinians to the table. I don’t understand why Israel is pursuing this settlement policy. If it really believes in a two-State solution, then it knows that those settlements inside the Palestinian territories will become Palestinian property. Stopping the settlements is vital as proof that Israel’s commitment to peace is sincere. Actually, the interpretation across the Arab world is that Israel does not want peace. On October 26, it will be 15 years since the peace treaty between Jordan and Israel. Is it real peace? It is a cold peace, and our relationship is getting colder. To make matters worse, there is Jerusalem. There is an attempt to change the political aspect, as we start to see Israelis encroaching on East Jerusalem, which is part of Palestinian territories occupied in 1967. You can’t change realities on the ground while negotiations are ongoing. I told Prime Minister Netanyahu: Jerusalem is of tremendous importance for Jordan, this is a red line that can not be crossed. Even more so regarding the issue of the Mosque. What is at stake in that issue? Why continue with the works and excavations when our documentation shows that they could undermine the foundations of the al-Aqsa Mosque? The sanctity of Jerusalem must be understood, as well as the potential for turning Jerusalem into a tinderbox. Why increase activities, with the risk of inflaming passions, at this critical time? Those actions are extremely provocative, not only to the Muslims but also to the Christians. Would you please explain, Your Majesty? The Hashemite Kingdom, as acknowledged by the peace treaty (with Israel), is responsible for both Muslim and Christian holy sites in Jerusalem. This is a tremendous responsibility that I inherited from His Majesty, the late King Hussein. We must protect property in Jerusalem that is undermined, slowly taken over by the municipality or the Israeli government. Yet Jerusalem should be a symbol of harmony, of peace between the three monotheistic faiths. A city closed to the any of the followers of the three monotheistic religions is a catastrophe. Netanyahu prefers, at present, an “economic peace” and he invites the Arab world to come and invest. Should the Arab world respond? How can you have an economic peace when there is no political security for the future of the Palestinians. It seems like we are always sidestepping the issue. We need to have a two-State solution, and this is what we are waiting for. Why does Jordan consider the two-State solution an issue of national security? Because, without that, the whole region will never enjoy the peace and stability it deserves. I hear discussions again, in Israeli and Palestinian circles alike, about a one-State solution, should the other one fail. Well, that is not a solution: it simply postpones the problem. Let’s assume, by pure hypothesis, that they achieve it – in other words that Israel were to remove the Palestinians of the West Bank into Jordan, against international condemnation. Does it solve the problem for the future of Israel? It doesn’t. Because inside of Israel, the Israeli Arab population in a few years will be 50 per cent of the Jewish State of Israel. As you can see, Israel would have solved nothing. What is needed is a much broader vision, a comprehensive peace with Arabs and Muslims. We are talking about an agreement with 57 nations, (note by the editor: from the Arab League and the Organization of the Islamic Conference), that don’t recognize Israel. Do you know what that means? It is a third of the world. And what if that doesn’t happen? If the statu quo were maintained, it would mean sliding into darkness, with all the imaginable consequences. I think the window is very limited, because as we go into 2010, if Israel does not believe in a two-State solution, the future of a Palestinian State is under fire, geographically, physically, on the ground. Already it is cantonized and it looks like a Swiss cheese. If we find ourselves, a year or two from now, still asking the same questions, then I fear that our generation will not see peace. In that case, what should be done to move the peace process? It would be up to America and Europe: We need courage from the Israeli politicians to sit down with the Palestinians, under very strong cover from the US President and very strong support from Europe, to move the process forward. It must decide: either integrate itself in the whole Arab/Muslim world, 57 nations that do not recognize it, or whether it wants to continue to stay fortress Israel and live with all the calamities that this will bring not only to Israelis and Palestinians but to all of us in the region, including the Mediterranean. At present Israel is digging a deeper and deeper whole. Still, there is the obstacle of Hamas, the divisions between Palestinian factions. How do they affect the peace process? We support Egyptian efforts to reconcile Hamas and Fatah. Reconciliation is essential for serving the interests of the Palestinian people. America and Europe decide their own policies. But we must recognize the urgency of the situation, the huge price we will all pay if we do not move forward. We must also recognize that there is a human catastrophe in Gaza, that the international community has to move faster to end the blockade. We are approaching winter now, and the human suffering can worsen. The West, at present, seems more focused on the negotiations with Iran. For the first time in thirty years, Washington and Teheran are talking. Would it be better for the Middle East? It is a development that I welcome strongly. There is no alternative to dialogue. Certainly our part of the world has witnessed too many wars: it does not need another cause for conflict, nor a conflict with Iran. And this is a concern. What is to be seen is if the dialogue leads to a fruitful understanding between Iran and America. Let’s keep our fingers crossed and see what happens. Would you regard an Iran armed with atomic weapons as a major threat? Our position has always been against any nuclear proliferation in the whole region, whether it is Iran or other countries. The Middle East will certainly be better off without nuclear weapons. But there is another crucial point. The challenge in the Middle East is the ambiguity of nuclear power, regarding many countries. The nuclear capabilities and programs of each nation should be declared, openly. Are you referring to Israel? Not only. Jordan itself is embarking on a peaceful nuclear energy program, but we want to be the model of total transparency. We are planning on a peaceful nuclear energy programme, that will enable us not just to be self sufficient but also to be a regional energy provider. Your Majesty, you are part of a new group of young leaders; you ask for results within this generation. Will that happen? Well, some define me as young; but I am 48 years old and getting on in age. And I have to remember that 70 percent of my country is younger than me. It has a right to peace and prosperity. Therefore, yes, I am in a hurry. The future is now. Today is the role of the younger generation. Was the Nobel prize awarded to President Obama also hurried? Or will it encourage him to strive for peace? I have congratulated President Obama on receiving the Nobel Prize. In Jordan, we have greatly appreciated his efforts to strengthen diplomacy and cooperation between people. However, beware: all the positive feelings generated by President Obama’s positive messages and gestures will evaporate unless people see real progress on the ground. Did anyone notice whether Alix Van Buren asked the Good King why he didn’t give the West Bank to the Palestinians when his Dad had control of the terrortory? Because it’s all about power, not human rights. If King H can’t show he’s made progress with the Destroy Israel project, he fears that someone will knock him off and seize power who claims he can do better, as has happened in Syria, Gaza, Lebanon, and Egypt. As for re-educating his people to re-align truth with fact by pushing peace with Israel and resettlement/normalization of the Palestinian Arabs, that could threaten the very foundation of monarchy and dictatorship throughout the region. be concepts. Not actual flesh and blood. Far better to be ruled by apartheid leaders, eh Amir? I am very sorry that you are embarrassed. I guess all Palestinians are more than embarrassed that 100kmm away there is a state illegally occupying their lands by violence, denying them basic human rights and showing to the world how a country calling itself a democracy can be worse than a dictatorship when it deals with destituted people who dare to call for justice. Maybe your secret wish is that Palestinians also belong to history, “no flesh and blood”. Well, don’t be so sure who may belong to history on the long run. The “destitute” thing is a myth that is maintained in Arab propaganda. and much.. better life conditions than the rest of ME Arabs. They even have a more democratic system than the rest of you. and because Arabs always spoil what’s good, and what they touch. And there’s nothing between South African Apartheid and Israel, SASA. Not in the roots, not in the cause, and not in practice. Go back to history books. I thought it was only Ahmadinejad who talked about “myth’ and “propanganda” I am glad to see you are emulating him when you speak about the happy “holy land” arabs and the dirty other arabs who “spoil all the good” things who give them. Maybe you should ask your governement to make use of your mythical nuclear bomb to eliminate them so you could live happily in your mythical democracy. Alix Van Buren writes: “What worries His Majesty King Abdullah II of Jordan most? The Iranian nuclear threat or a possible Israeli intransigence?” Now that’s calling a spade a possible spade. Mr. Maleh was not lying,there is a lot of corruption,He was not hurting the president,as he was giving him advise, it should be heeded and appreciated. And of course, Ahmed has to be nice and diplomatic to the generic Saudi fellow guess who is only interested in proving that his country did not change but it was Syria that changed. Well Majed, if Mr. Maleh is spreading lies as the super clean military court is telling us and I totally trust them, you should to, then he deserve more than prison and as quickly as possible, we don’t want our perfect Syrian society to be exposed to such liars. See how fast the justice is served for the three men killing the gold smith in Aleppo, or the three youth who raped the little girl, you see, in a pure, perfect and uncorrupted society like ours we have to be tough with liars and I think that he should be put in jail for a very long time he is still young and in great health, he is only 78yo, he is a very very very very dangerous man on every Syrian that we all need to reject. Let’s praise this great military court and this great government for there swift and great action to put this dangerous young man with the name of Haytham Al Maleh away from all of us. I feel so safe, don’t you? FYI: the last issue of National Geographic has a piece about Syria. >>> Arabs always spoil what’s good, and what they touch. I take it that the piece about Dr. Dan Shiftan in NRG has emboldened you. Very good, let’s see where you can take your hate discourse from here. What are the educational/experiences of Mr. Salkini to be in this important position and how confident were the Syrian embassy to put him there, do you think he did a good job? Picture wise is good, I couldn’t justify the Asian flavor in the middle since the Syrian culture is very rich, complex and unique that you don’t need to add any other flavor to what you already got when you want to spread a message asking foreigners to visit the country, what do you think? It is very well done, and it shows Syria in some of its many ancient flavors. DAMASCUS, Oct 22 (Reuters) – Syrian President Bashar al-Assad sought to ease tension with the European Union on Thursday after an economic and political deal between the two sides faltered. Diplomats in Damascus said the Syrian government has indefinitely postponed signing the deal, known as the association agreement, which was due to be signed in Brussels next week and took almost 7 years of protracted negotiations. “As long as Europe is interested in peace, which is my priority, I have to have cooperation with Europe, whether it is the European Union or certain other (European) countries,” Assad said after a meeting with Finland’s President Tarja Halonen. The deal has a political side, calling for respect for human rights and allowing the issue to be raised in bilateral talks as Syrian authorities intensify a campaign of arrests against dissidents and independent figures opposed to the Baath Party, which has ruled Syria since taking power in a 1963 coup. Syrian officials have not publicly commented on the reasons for not signing the deal, beyond saying that they needed more time to study the agreement, although the draft text was finalised and initialled in a ceremony in Damascus last December. Assad did not mention the association agreement directly. He said a drive by Syria to strengthen relations with its northern neighbour Turkey in the last several years would not come at the expense of Europe. The agreement qualifies Syria for more aid from the EU, beyond the 500 million euros ($748.6 million) it has received since 1979, and opens its market further to European goods. Syria’s trade deficit hit a record of $4 billion last year, partly due to more imports from Turkey, which mediated peace talks between Syria and Israel that were suspended last year. The agreement encountered opposition from the Netherlands, which voiced concerns about Syria’s human rights record and its the rising number of political prisoners. Other European countries argued that it would strengthen the hand of what they termed as reformers within the Syrian government. Deputy Prime Minister Abdallah al-Dardari, a proponent of economic reform close to Assad, had spearheaded Syria’s efforts to sign the agreement. The decision ultimately rests with Assad, who has steered Syria out of Western isolation in the past two years and is seeking better ties with the United States and peace with Israel based on the return of the occupied Golan Heights, despite a long standing alliance with Iran. The diplomats said the agreement would require the two sides to agree on an action plan that several European countries were keen to include human rights, especially after Syrian authorities arrested 78-year-old dissident Haitham Maleh last week. Maleh is one of the last outspoken critics of the political system inside Syria and winner of the Dutch Geuzen medal in 2006 for his advocacy of freedom and democracy. Khalil Maatouk, a lawyer defending Maleh, said that a military prosecutor has charged his client with several political counts, the most serious of which is “spreading false news”, which carries a 3 to 15 years prison sentence. Assad has repeatedly said that Syrian dissidents are dealt with fairly by the judiciary and made it clear that his priority was to “maintain national cohesion” in face of what he described as external challenges. her late father, and loved King Hussein, “Heaven” advices!!!! He is still young….and as a lot to learn, about politics and politicians. The issue about Israel and Palestine, WILL NEVER BE SOLVED!!!!!!!! No Barack Obama….no King Abdullah…no peace treats…will get the peace, that BOTH deserve!!!!!! Believe me…I know what I am talking about!!!! For the world!!!! READ THE MID-EAST HISTORY!!!!!!!!!!!!!!! ITS ALL THERE!!!!!!!!!! ( a bunch of lyers)…are looking for a moment of glory!!!!!!!!! Forget about this subject!!!!! NO PEACE WILL BE , FOR SURE….BETWEEN ISRALELIS AND PALESTINIENS!!!!!!!!!!!! Wish the best for the mid.east!!! Peace that what we want…but NOBODY WILL GET IT!!!!!!!!! !